We hope the holidays were lovely and 2016 has been wonderful for everyone so far. As the new year often calls for resolutions, we're excited to announce a couple of our contributions which we hope you'll find handy. A long requested feature is finally here. Omise now makes it possible for account owners to allow multiple team members within the organization to have access to the dashboard through our newly launched feature, Team. 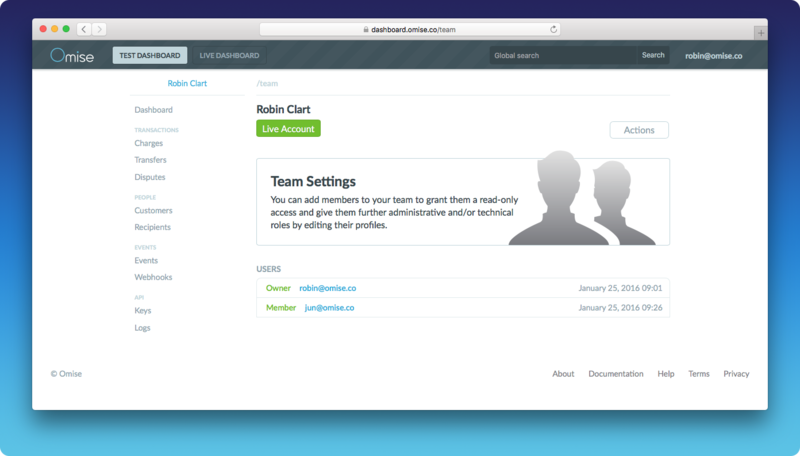 With Team, account owners are able to invite members and customize the user hierarchy to ease collaboration and promote greater efficiency. Each user can be a member of one or multiple teams and their access could be revoked by the account owner at anytime. Be it an accountant for bookkeeping or a developer monitoring logs, this new feature grants full control over each member's account as predefined by the account owner. The old saying goes, "Too many cooks can spoil the broth" -but we say team collaborations can go a long way! Listen up. We've improved the after-sales experience for merchants with an opportunity of Free Refunds. Hooray! Normally when making refunds the original 3.65% transaction fee deducted from the sales won't be returned. But from now on we will make a full return to merchants whenever possible. The sooner refunds are done, the higher chance of the fee being returned. No special requirements, no need to opt-in, no codes to change. Our system will automatically determine the applicability and process the refund accordingly.